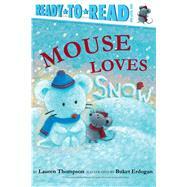 On a bright, snowy day Mouse discovers sledding, skating, and making snow mice in this beautiful Pre-Level 1 Ready-to-Read book all about winter! When Mouse and Poppa venture into the great outdoors, they discover all the seasonal pastimes that make winter a special time of year for kids. From making snow angels to building a snowman—who looks more like a snow mouse—this book is brimming with fun. Young readers are sure to enjoy Lauren Thompson’s simple, energetic text and Buket Erdogan’s sweet, playful illustrations as they learn to recognize words and begin to read on their very own!